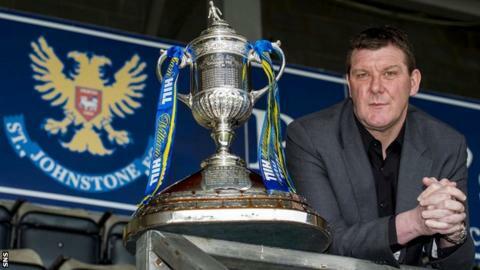 St Johnstone boss Tommy Wright and his players say they are the underdogs in Sunday's semi-final with Aberdeen but are confident they can upset the Dons. Saints have lost seven semi-finals in 15 years and have never won a cup. And the Dons triumphed 4-0 against St Johnstone in this season's Scottish League Cup semi-final. "If we look at the games we've played against them, we know we can do better," said Wright. "Hopefully we can do that on Sunday." Although Saints have secured a top-six Scottish Premiership spot, they have yet to score in four meetings with Derek McInnes's side in all competitions so far this term. "We are confident - we believe we can win the game," Wright explained. "Performances in recent weeks have been really good and overall this season we've performed at a high level so we're happy enough with where we are. "We realise it's going to be a tough game. Derek has done a tremendous job with Aberdeen and they've been outstanding all season. Outside Celtic, they've been the best team. "But we feel we've enough fire power and enough quality in our team that can hurt them. "We've had some great outstanding match performances in one-off games this year. Rosenborg away [St Johnstone's 1-0 win in the Europa League qualifiers] is an example of that." Stevie May's 23 goals have been crucial to St Johnstone's season and the striker is happy to bear the burden of scoring. "You want pressure. You want to be expected to score and expect yourself to score," he told BBC Scotland. "As a team, I don't think anybody cares how [the goals] go in, especially on Sunday. If the ball goes in the net, no matter who's kicking it, we're going to be happy. "We are underdogs and I think that does suit us, deep down. We fancy ourselves. Everyone else expects Aberdeen go on to the final and probably win as they're favourites." Wright also believes his sides are underdogs but can progress to meet either Rangers or Dundee United at Celtic Park in May. "Everybody sort of presumes it's going to be an Aberdeen-Dundee United final but I think myself and [Rangers manager] Ally [McCoist] will probably have something to say about that," explained the Northern Irishman. "That's the way it is - we're the smallest club in the last four. We don't have a history of getting to finals, a history of winning things so it's just human nature that people will favour Aberdeen. "I'm praising Aberdeen but I think we've got a lot of quality as well in our side. "We're 180 minutes - or maybe a little bit longer if it goes to extra time - away from creating a little bit of history at the club."